Fire crews at the scene of a house fire after an explosion on Lime Lake Dr on June 21. Photo by Cheryl Barrigear on WZZM13.com. 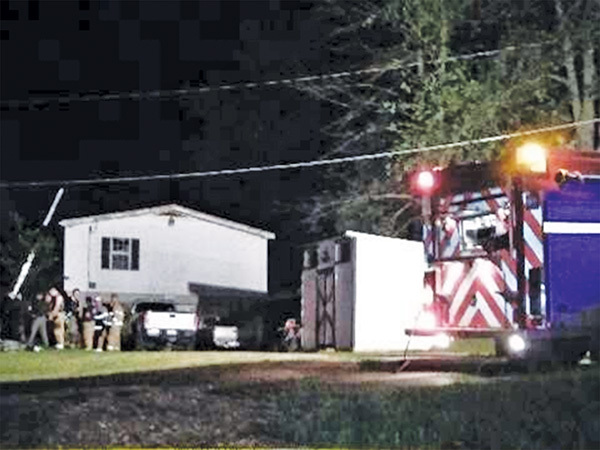 Neighbors called 9-1-1 after hearing an explosion on Wednesday evening, June 21, at 13386 Lime Lake Dr. According to Solon Township’s Deputy Fire Chief Chris Paige, they were called out at 10:59 p.m. The first unit arrived on scene to see heavy smoke, with flames showing in the main floor of the home. The three occupants of the home were already out of the house. “We had it out within about a half hour, but were on scene an addition 1-1/2 hours checking for hot spots,” said Paige. Algoma, Kent City, and Sand Lake Fire Departments all assisted at the scene. The Kent County Sheriff Department also responded to the scene. According to police, a 39-year-old resident told deputies that they were making marijuana wax prior to the explosion. The man suffered severe burns to his hands and feet, as well as cuts from glass, and was transported to Spectrum Butterworth Hospital. The fire is still under investigation, and authorities have not yet released any more information. Marijuana wax is also known as Honeycomb, Wax, Butter, and BHO (butane hash oil). It’s made from oils found in pot plants and has a higher concentration of THC than most marijuana products. Highly flammable butane gas is used to extract the THC from the marijuana leaf, and has resulted in home explosions, injuries, and deaths.